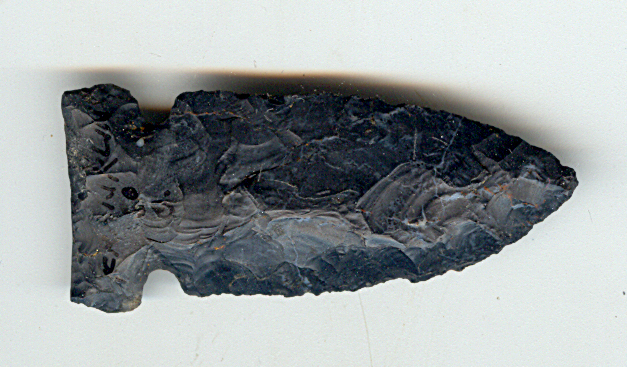 A Medium To Large Size, Very Well Made, Newton Falls Point That Exhibits Stone Sheen And Surface Aging Coloration Patina, Soil Deposits, Heavy Rolled Basal Stem Grinding, Mineral Deposits, Correct Blade Sharpening Reduction, Polished Blade Hinge Use Wear, Aging In The Notches, Correct Material And Manufacture For The Area Found. This Type Is Similar To The Big Sandy in Tennessee, Hemphill And Other Side Notched Points In Missouri. This Is A Classic Example Made Of A Beautiful Material! Includes A Ken Partain Certificate Of Authenticity!